Ford introduced the 5th generation of Thunderbird luxury coupe in 1967, with what can only be described as the vehicular equivalent of fat Elvis. Gone was the slim figure, chiseled good looks, and agile hips -- but the booming voice was still there -- hidden behind giant sunglasses and a cape -- but still there. 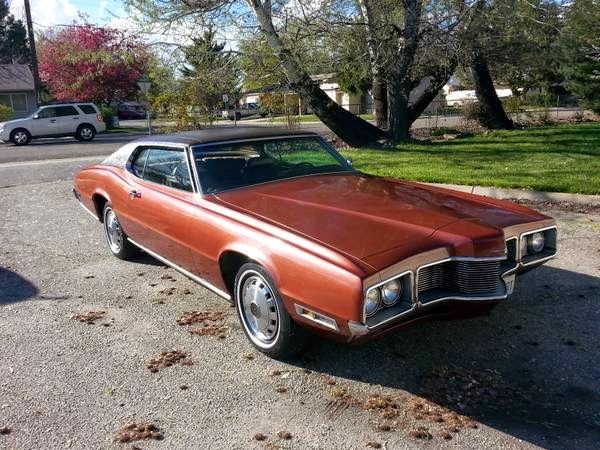 Find this 1970 Ford Thunderbird with 429 ThunderJet V8 offered for $5000 in Boise, ID via craigslist. Tip from FuelTruck. Compared to the original Thunderbird, this hawk nosed monster tips the scales with an entire Fiat X1/9 worth of additional mass. 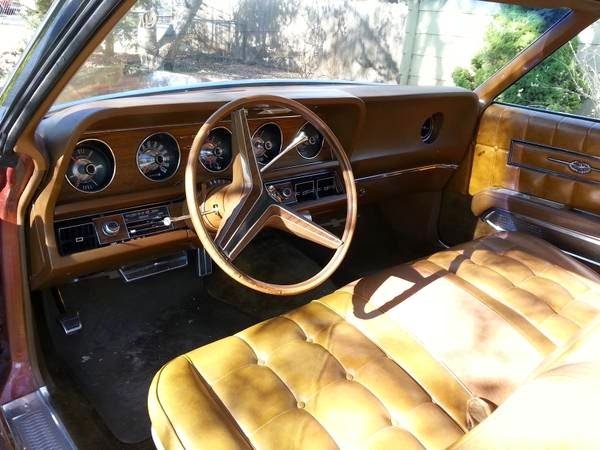 It is also covered in a ghastly shade of baby poop brown and has an old dog turd colored vinyl top. Oddly enough, this was not the ugliest or worst Thunderbird ever built (that honor goes to the eleventh generation 2002-2005 T-Bird reboot purchased by blind people around the country). This Thunderbird is equipped with engine code N - meaning it has the 429 ThunderJet engine (known as the 429 CobraJet when installed in the Mustang) - a big block beast that was originally added to passenger cars for NASCAR homologation purposes. Displacing a massive 7.0 liters and equipped with a Motorcraft 4-barrel carburetor the ThunderJet puts out 360 horsepower and 480 ft-lbs of stump pulling torque. Did you see that they resurrected Thunderbirds? I haven't seen it yet and I don't think I'm interested if there are no visible strings. I like this car because it literally looks like how they use to draw in Detroit in the 1960s. I'm starting to almost appreciate the avant gard proportions of the '02-'05 'gilf' special. That strange rear taper instantly turns me off, pretty colors not withstanding. And another thing - I can't thank K2 enough for ridding me of all fear of commenting waaaaaaay (kinda) off topic. Impulsively enabling my impulsive nature. "Fifth time caller, long time lurker here..."
"Creativity and enthusiasm should know no bounds." You know who wrote that? Me. I just did. And I believe it. You may be funnin' me but I take what you wrote as a compliment and a reminder of why I'm here on DT. I don't know how El Jefe and the DT staff feel about it, but I'm not interested in writing about cars to DTers. Instead, I want to write with other DTers about cars and life and anything else that we want to kick around. That's what can make DT different from all the other sites; wit, kindness, enthusiasm, humor AND cars! Regardless, I'm looking forward to hearing more from you ESK. But you still haven't answered my question; what do you drive and what drives you? Maybe that's too personal. In that case, just answer what you will. Amongst our weaponry are such diverse elements as: wit, kindness, humor, cars, and nice red uniforms. 1972 Oldsmobile Delta 88 coupe has been my dd for about 8 years. I bought her from the deceased original owner through a dealer in Mitchell, NE for 3 grand with 65k miles, now she has 105k under her wide belt. Most don't believe how great she is on snow; nor do they believe how I can muster 18 mpg hwy when I keep my foot light as I can. HEI and disconnected AC work wonders for the 455's efficiency. I've been exclusively driving my company work vehicle ('14 Silverado) for 9 months, to the chagrin of my sweet Delta Burke. As a stripper work truck, I am blown away. Just as cozy quiet and smooth as can be. 36K miles in 7 months; I get allot of bonding time with Charlene. '65 Honda 305 Scrambler has been patiently dozing in the garage for a decade and I can't wait to sniff those pipes again. What drives me? Hmmmm.... Love and understanding of different viewpoints, meeting and bonding with strangers never to see them again, and raising my family while making my home something I'm proud of more every day. It was definitely a compliment, Mt.Kilimanjaro. A dialogue is worth twice as much as a monologue. I like what drives you. What do you do for a living? K2, as a long time DT reader I must say that since you have been commenting the volume of commenter's has had a huge increase. Which I'm sure all the DTers appreciate. Good on you sir. Tell us about your Avatar, William. That looks pretty amazing. "with what can only be described as the vehicular equivalent of fat Elvis." I don't care if you like the car or no, that's funny. I kind of dig the rear 3/4 shot...however not enough to make up for the hawkman nose. Not quite sure why you wanted to post that image (explanation? ), but here you go! I remember loving the look of the wall 'o' taillights whenever we were behind one of these as a kid. The 'Bird's had some big ups and downs over the years, not just in size either. This was from the era when the 'Bird shared everything with the Lincoln Mark, but while it was a ponderous pig it was at least a fairly attractive side of bacon. Wow. Five G's. I can think of worse ways to spend Five grand on a car. Totally did it. I would own this thing, and maybe after some rhinoplasty I may even drive this thing. If someone removed the beak and replaced it with a flatish piece containing a flat grill this would look almost sleek. At least too me. 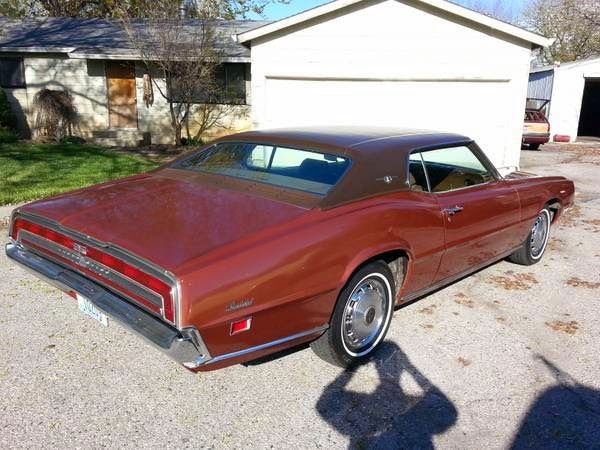 Then you're looking for a Torino Talladega, not a Toonderbird. Maybe one of the '68-70 Birds. 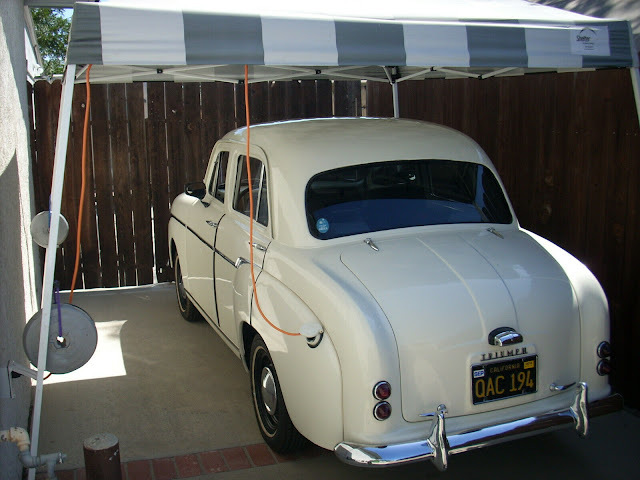 I had relatives who had a four-door '69 with LANDAU BARS - never mind your stinking opera lights, it had LANDAU BARS. I had a love-hate relationship with that car. It was full of clever bits of electropneumomechanical overcomplexity that I loved, all seemed to be straight out of postwar American Flyer model trains, and I was amazed that they managed to fill almost every square inch of its huge engine compartment with something cast from iron, and the interior had a wonderful aesthetic. But it drove like crap. Love the colors. End of an era.